I’ve loved the Batman for as long as I can remember. And when I say loved, I mean it. I used to carry around an action figure of Batman, and it’s most exciting feature was the utility belt/grappling hook combination. You could stretch it all the way out and SNAP…it’d come right back to Batman. I loved that. I suppose I loved Superman a bit more, for a variety of reason. But the Batman was always a much more compelling personality. For a growing boy, a boy whose fists would fly at the faintest threat of a fight, who’d rise up against the infantile and imagined injustices that caused the lunchroom and the playground to seem like battlefields, the Batman gave me hope, and a hopeful way to live in the world. Injustice, be gone! Villains, beware! The Batman was once just a child, Bruce Wayne, who was formed by the tragedy of his parent’s murder, and grew into the Dark Knight, Gotham City’s vengeful protector. But he’s still just a man. And if the Batman is just a man, just a human like the rest of us, then perhaps there is hope for those of us who suffered under the injustice of bullies or the scorn of unfair teachers. Maybe that’s the appeal of the Batman. That he’s one of us. Not an alien from Krypton. Not a demigod from Olympus. The Batman is just that…a man…a man who’d had enough of the sickness of his city…a man who honed his body and mind into a weapon to struggle with the evils prevailing against the world. A man, though. A man. Flesh and blood. Flesh and blood like the rest of us. The Batman reminds us that we don’t have to stand idly by and watch as evil wreaks havoc. We can rise up and do something about it…something, anything…it doesn’t matter what we do, or how we go about this struggle. The Batman reminds us that we can do something to fight against evil. The Batman gives us hope. As a fan, as one who’s loved this character my entire life, I can tell you that one reason I went to a midnight showing of The Dark Knight Rises was because of the hope Batman instills in me…instills in that little boy living somewhere inside the grown man I am today. And I’m willing to bet that everyone in that theater in Aurora was there because the Batman gives them hope too. Entertains them. Excites them. Inspires them. The credits began to roll, and the crowd cheered because they were going to see the Batman struggle against the greatest injustice Gotham City had ever known. But they never got to see the end of that story. A man, a sick man, decided to act in a most heinous and despicable manner. Their world was shattered, turned upside down. And our world was turned upside down as well. We can’t see these things coming. God, how I wish we could. But we can’t. And so when these storms hit, they hit hard. They remind us that Gotham City isn’t the only place full of tragedy. It’s right here, in our midst. And our chests get tight. We can’t breathe from shock. And when we finally form words, we shout at the sky, “Why, God? Why?” When we’re resting safely and securely, or when we’re so pumped from anticipation we can’t help but jump for joy, or when we’re holding our partners good and tight, and then the world seems to be plunged into darkness and chaos…fear finds its way to break us down, to bind us. It whispers to us that we’re all alone, and there’s no hope. Hopeless comes in many forms, but terror may be chief among them. The terror that comes when, like those in Aurora, we stare death straight in the face. How do we make sense of such fear, terror, and hopelessness? Maybe I’m being too interpretive, but reading this Gospel text in light of the events in Aurora, I couldn’t help but see shades of tragedy, disorientation, and chaos echoing through this story. The crowd presses in, the disciples among them, to see Jesus…Jesus the wonderworker, Jesus the miracle man, Jesus the shower of signs! This man heals the sick! Brings sight to the blind! This man brings hope to the hopeless and downtrodden. The crowd presses in, just to catch a glimpse of the one who continues to perplex and surprise all those who’ve followed him. And he surprises us, as readers. Rather than taking this as an opportunity to expound theologically on the nature of God and the covenant between YHWH and Israel, Jesus takes a simpler, more practical approach. He’s worried about having enough food for the guests: “Where are we to buy bread for these people to eat?” The disciples begin to doubt, to fret, to fear. “Six months’ wages would not buy enough bread for each of them to get a little.” And Jesus, as he always does, finds a way to confound the faithlessness and fear of his followers: “There is a boy here who has five barley loaves and two fish. But what are they among so many people?’ Jesus said, ‘Make the people sit down.’ Now there was a great deal of grass in the place, so they sat down, about five thousand in all. Then Jesus took the loaves, and when he had given thanks, he distributed them to those who were seated; so also the fish, as much as they wanted.” Like any good host, Jesus sits his guests down. He gets them good and comfy…as comfy as one could be sitting amongst five thousand people I suppose. And right before their very eyes, he takes 5 loaves and 2 fish, barely enough for 15 people, and makes a feast for 5,000. Scripture is clear: “As much as they wanted.” This wasn’t a scant meal of dry crumbs or crumbled fish. This was a feast! And it wasn’t just a feast for those 5,000 followers. It was a feast for the disciples, too. You see, the disciples weren’t working that day. They weren’t given the responsibility to walk amongst the crowd, giving them the gifts Jesus had multiplied. No. They were sitting down, with the crowd, bearing witness to this miraculous feeding. And here’s Jesus, as John says, “distributing to those who were seated.” I’ve got this image of Jesus walking through the crowd, offering each soul there some bread and fish with a smile, a gentle touch, an affirming, uplifting gaze. Time and time again, the Gospels illustrate the way Jesus graciously offers himself, the gift of his friendship and fellowship, to those who would receive. Imagine, for a moment, receiving bread and fish from the hand of Jesus. What would you feel? I’m sitting there, tired from the walk. It’s a bit dusty, and there’s a stale wind. I’m staring at Jesus, reaching into a basket, pulling more and more bread from it as if there’s no bottom. He stretches out his hands to the sky, says a prayer of thanks, and begins to walk. And he walks straight to me. He’s smiling, like he’s so excited to see me. He kneels down next to me, one hand offering me bread, the other on my shoulder. “For my friend,” he says. And in that moment, I feel safe, secure. I feel loved. I imagine that’s what the disciples felt. They’ve given up their lives to follow this man, and he hasn’t let them down yet. They continually bear witness to his miracles, to his grace, his mercy, his power. They’ve got every reason in the world to assume all has been made right, and the kingdom of God is rushing in like an unstoppable flood. But, you know, the story takes an unexpected turn. Jesus leaves that glorious feast to escape the crowd that’s clamoring for him to become king. He finds solace on a mountaintop, but his disciples continue their journey. Now remember, these men are fishermen. They’ve grown up on the water; they’ve made their living on the water. And they’ve just seen a miracle that’s afforded them feelings of blessing, safety, security, and hope. But all those happy feelings come crashing down when a storm overtakes them, and feelings of terror and disorientation flood them, stripping away from them any feelings of happiness, any feelings of joy, any feelings of security. In a familiar place, on a familiar vessel, in a place where they assume nothing can take them by surprise…they’re shocked and shattered by a storm and an appearance of a familiar face suddenly become terror-inducing. They’re shattered and driven to fear by the chaos plaguing them and the specter threatening them. And who can blame them? Like anyone who’s unexpectedly thrust into chaos and confusion, they’ve lost all pretense of control, all pretense of survival. They’ve been violently ripped from a place of comfort and security, and thrown into a living hell…a hell not of caustic flames, but crushing waves. Perhaps that’s what it felt like, in that theater last Friday night. To be waiting with baited breath for the arrival of the Dark Knight, the victor of Gotham City…all sitting comfortably in plush chairs, a man celebrating his birthday with his girlfriend, a mother with her young daughter, hoping to share with her the hope she gets from watching Batman fight injustice. And in a matter of seconds…a door opens, screams ring out, waves of terror…chaos ensues. Like the disciples, those theatergoers are left shocked and shattered, terrified by the chaos, wondering how to make sense of what’s happening. Perhaps feeling something similar. Wondering, praying, questioning. Where was God in all of this? Turning again to the Gospel, maybe we can catch a glimpse of something, someone, that’ll help us make sense of the chaos then, and the chaos now. “When they had rowed about three or four miles, they saw Jesus walking on the sea and coming near the boat, and they were terrified. But he said to them, ‘It is I; do not be afraid.” How sweet his voice must have been to their ears. The wind was howling, hounding and haunting them as they journeyed to the other side. The see this man, this figure, walking on the waves that threaten to crush, and he speaks words oh so sweet to their ears: “It is I; do not be afraid.” And immediately they knew who it was. It was Jesus. It was their savior. It was the one who was willing, and able, to walk upon and within the chaos threatening them. Though other Gospels want to portray this event as a way of understanding Jesus’ dominion and power over nature, John’s got another agenda. He’s trying to pull back the curtain and reveal the heart of who God is. And here, in this moment, in a moment where these men are scared, trying to finish their journey, trying to stay alive…we see that God is a god who comes to us in our suffering, in our sadness, in the situations that threaten to crush us, to kill us. In Jesus, we see what kind of God we live with. A God who’s with us in the midst of the blood, the sweat, the howling wind, the terror-induced cries for mercy, the raging questions, the screams of agony. A God who whispers in our ears, “It is I; do not be afraid.” And though we might want something more, something we think we deserve, like a God who makes everything suddenly okay, who takes all the pain away, that’s not really what we need. We need a God who knows exactly what it feels like to face our fears. We need a God who’s been where we are. We need a God who sits with us as we struggle to make sense of chaos and confusion, a God who doesn’t leave us alone, a God who doesn’t pretend our pain away. We need a God who’s our hero not because of what God does for us, or to us. We need a God who’s our hero simply because God lives beside us, among us, and bears our struggles with us, even unto the bitter end. The thing about the Batman is that he’s a hero because of what he does. He’s a hero by his doing. He fights crime, he destroys the weapons of the wicked, he triumphs over evil by grinding it below his boot. But as much as I love the Batman, now’s not the time for a hero who’s a hero by what he does, by his doing. We need a hero who’s a hero by his being…being with us in our tears, being with us in our anger, our rage, our cries for justice…being with us when we scream at the sky for answers, or crumple onto a hospital floor into a vulnerable, damaged ball. Yes, Jesus ‘does’ for us as he gives us gracefully the gifts of bread and fish, however we receive those symbolic gifts today. But this passage turns not on the multiplication of bread, but on the way a crew of scared fishermen are put at east by the gentle voice of Jesus, standing on those waves of chaos: “I am here. It’s me. Don’t be afraid.” And where as the other Gospels portray Jesus actually calming the storm, showing us his power over nature, John takes a different approach. The storm still rages. Its wind still howls and the waves…the waves still crash and crush. But, Jesus never leaves them. He rides out the storm with them. He reveals himself to be the incarnation of a God who, like every great mother, tends to our wounds and tears even as the world continues to fall apart. The disciples make it to the other side, but not because of anything Jesus did. They make it alive and well simply by his being with them. And he promised to always be with us, even unto the end of the age. 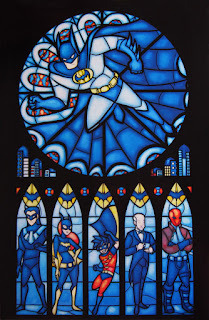 For sure, I believe in the Batman, as a symbol of the way we can struggle against injustice. But he’s ultimately not the hero we need right now. We need Jesus, our mother, who saves us by his being with us in the midst of chaos. 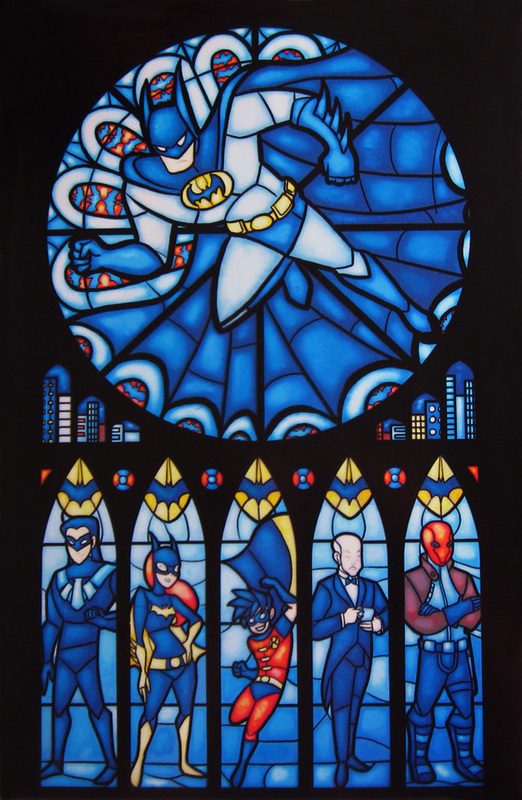 Yes, I still believe in the Batman. I just believe in Jesus more. *I preached this on July 29th, 2012 at Lebanon Chapel in Wilmington NC. Though the question of theodicy is an unanswerable questions, this is my attempt to make some sense of what happened in Aurora, CO.